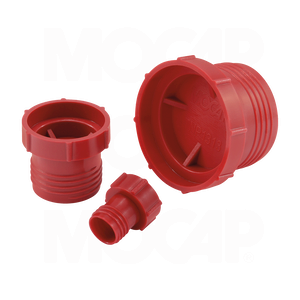 MOCAP Threaded Plastic Plugs are designed for use on MS-21921 Flareless Tube and Nut Assemblies. These Threaded Plastic Plugs are ridged for easy use in manual assembly and removal. They are designed to fit MS-21921 tube and nut assemblies interchangeably. Protects threaded assemblies from moisture, dust and damage during production, shipping and storage. Our TNP Series Threaded Plugs are moulded in Red polyethylene plastic and sized to fit Flareless Tube and Nut Assemblies from 3/8-24 thru 1-5/16-12. Many Sizes of Our Plugs for MS-21921 Flareless Tube and Nut Assemblies are Stocked for Immediate Shipment.